Keeping your fireplace clean doesn't just make it look nicer. A clean fireplace also drafts better for a better fire the next time you want to light one. Keep it cleaned up and tended properly with this classically styled complete set of sturdy fireplace tools. The package includes a broom, a poker, tongs, a shovel and a stand that is approximately 31". They come with a black finish and a ball-handle that is easily to grasp. This is made of cast iron. What size is the base on this unit? The base of this tool set is 8" x 8". Are the tongs a type of scissor? The tongs are indeed a scissor style, with the attachment point near the tongs ends to allow for more leverage at the handles. What are all of them dimensions? The shovel is 26". The poker is 26 1/4". The tongs are 26 3/4". The brush is 26". The diameter of the rod portion of the tools is 1/2". The shovel head measures 5” wide by 7” long. The broom head measures 5 1/8” wide by 4 �” long. Bought this for a friend whose set had seen much better days. It was just what she needed. Great value. The picture here is the set I bought and I am very pleased with it. It was easy to assemble and looks very good on my fireplace. Several friends have commented on it already and I haven't had it very long, so I am happy with it to say the least. I give it a 5 Star Plus rating! This is not a bad set for the price. It's good for someone not using a fireplace on a regular basis. Great addition to our fireplace. Upon receiving the fireplace tools, I could see that we received the right accessories for our fireplace. The product was packed so that it was in good condition upon arrival. I would order from the Fireplace store for any additional items that I may need. item was exactly what we expected when we placed our order. easy to put together. ordered for other family members who were very pleased with this item. Will review all products you have available and it we find something else that someone needs or we will use we certainly will order from your company. The tool set arrived promptly and was easy to assemble. My wife and I are very impressed with the appearance and quality of the product for the price. The broom bristles are the weakest feature of the kit; workable, but somewhat flimsy. The handles on the tongs are difficult to keep fastened tightly, but not a real problem. Overall, very pleased. great quality and not broken! I was very pleased with these fireplace tools. My order came quickly and nothing was broken. I had ordered fireplace tools from another store and when I received them, they were broken and not of good quality. The tools from eFireplaceStore.com were good quality and not broken! ConsTook a little too long to receive from the manufacturer. I know that brass tools are expensive. We did expect more, though, when we ordered these. The tools themselves are functional and useful but the quality of product is very sub-standard. On our 5-piece set, the piece that holds all the tools on the stand was flaking significantly. When I rubbed on it, almost all of the "brass" paint came off. All of the pieces were nicked at the handles, and generally poor quality. this company was great about refunding our $$. We just sent photos of the deficient parts and described the problem. Their customer service was great! The tool set came sooner than expected. Relatively easy to assembly. Looks very nice by the gas fireplace. Gives the fireplace door and the surrounding area an expensive look. The price was definitely right with this set of tools. Each of the four tools works well, but after only using it four times so far I find that the handles come loose easily and I have to tighten them. But the stand is steady and it is great to have all four tools at my fingertips. Shipped fast. Easy to put together. Looks great. Our fireplace tool set at our family cabin was pretty well used up so we decided to purchase the UF-T51030PK 5-piece Polished Brass and Black Fireplace Tool Set. This set was a low cost set but was surprised with the quality. When I assembled the fireplace tool set I applied Loctite 242 Threadlocker to the threads so as to keep the handles from coming loose or coming off during use. 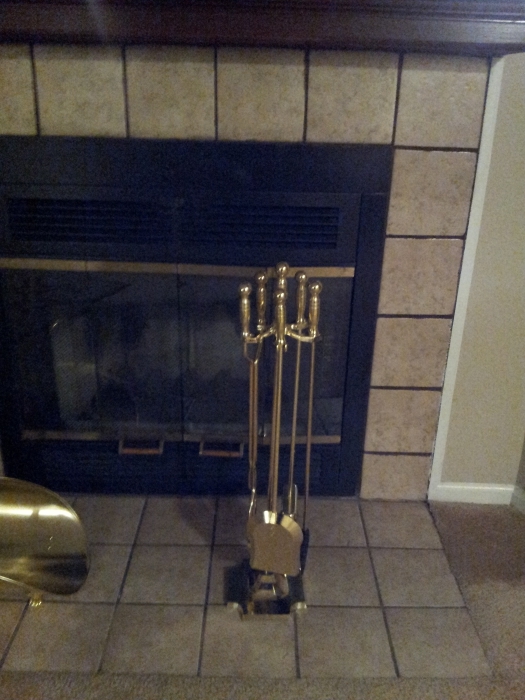 I would recommend this fireplace tool set as a low cost but decent made set for every day use. I am so happy to have received my order earlier than expected. It is a high quality fireplace set that is sure to last for years. I gave this fireplace set as a Christmas gift. The receiver was thrilled with it and loves it. Order early if you want it during the busy Christmas holiday season. We have been limping along with just a couple of tools for the fireplace and wanted to find a set that would be heavy enough to withstand hard use. This set is significantly better than what we had! The company may need to find a different way to package it because the outside was damaged when it arrived. It ended up not being a problem because the tools were packaged well enough that they were still in new condition. I am very happy with this merchandise. You wont be sorry if you take a little time to scan the assembly instructions first. It will be much easier to put together. It is mostly a well-made set, but the stand wobbles some and the broom seems like it may not last. The tools fit snugly in my hand. This set almost looked like it had been a returned product because the tools were not encased in the plastic bags that should have held them. Also, the box itself was ripped. It is a good set, though. I put them together in a snap. They look nice and like they will be long-lasting. I would rate it better if the packaging had been better. Most of this set is acceptable. The broom seems a little shabby and I will have to glue it to stay together. The other tools all seem adequate and the set complements our insert the way I like. This set is very beautiful! It was shipped out right away and I was able to give it as a Christmas gift. Thank you for a smooth transaction. I have been using this set now for about two months. In that two months, the handles have loosened up several times. I just tighten them by hand when that happens. Other than that, the price was right and they should work well for regular use around the fireplace. I mainly wanted a tool set that I could use outside for my grill since I like to move the charcoal around when it is hot without burning myself. The tongs do a terrific job for this. For regular fireplace use, the tongs are not quite as wide as they should be to do a good job. When you try to pick up wood, it is kind of shaky in the tongs depending on the size of the wood. Coal doesnt stay in like it should either, but tends to fall through. Dont be concerned that it says some assembly required. All that is needed is to screw the handles onto the poker, tongs, shovel, broom and stand. I wouldnt give it a perfect rating, but pretty close. This set looks really great! It stands a little crooked, but it holds the pieces in decently enough. It was a good purchase and I am satisfied. I bought this set because my previous set was no longer a bright, shiny brass. However, this set is not nearly as heavy as the old set. And it almost seems as though some of the pieces of the stand are made with plastic. Maybe it is a way of cost-cutting, but they dont seem strong enough to hold the tools. The tools seem very firm, but when they are in the stand it seems a little unsteady. It is a good fireplace tool set and we are not sorry we bought it. You might be surprised at the affordability of this lovely fireplace set. But you can expect a set that is easily as good of quality as other sets that cost more than $100. I compared prices online and at shops in the area. I am satisfied and think you will be, too.